With over 80 persons from both the public and private sectors responding to the National Procurement and Tender Administration’s (NPTA) call for additional evaluators of government contracts, the agency yesterday announced that payment will be upped from $3000 per contract. 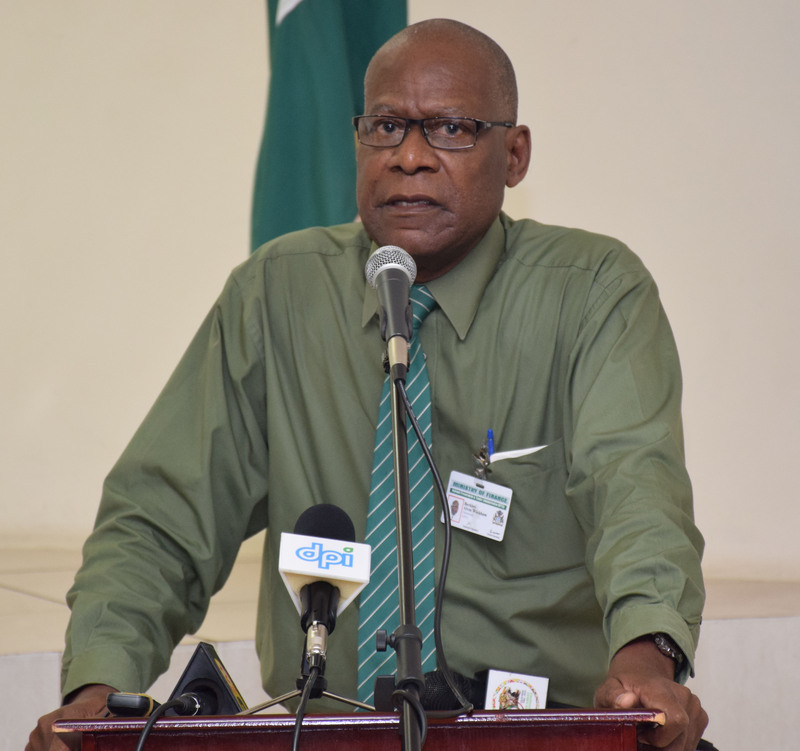 “ It was a nominal fee we had there for some time…I have spoken to the Minister (of Finance) about it and we are actively dealing with that…it will be raised I am certain about that,” NPTAB’s Chairman Berkeley Wickham said yesterday. The agency yesterday held an orientation session for potential evaluators at the Guyana Police Force Training Centre. Braving heavy rains yesterday, over 40 persons turned up for the orientation but Wickham said that about 80 had expressed interest in becoming evaluators and had told NPTAB that they would have been present. The NPTAB Chairman was quick to point out that the increase in fees paid to evaluators per contract was being upped to “defray any expenses they may have because the evaluators presently come from within the public sector” and they are not being paid for their additional work. Last month, the NPTA took to advertising countrywide with the aim of extending its current pool of evaluators, approximately 200, across all government entities which participate in procurement. It especially appealed to persons with appropriate expertise and encouraged retirees to apply. Wickham reminded that persons from all sectors were encouraged to apply, “You can come from any sector it did not say just public…,” he stated. The NPTA has faced scrutiny over evaluators for the large number of contracts it presides over. Critics have said that a small pool of evaluators have been in charge and many of them are in conflict positions as they come from the very ministries and agencies which are procuring goods and services. Furthermore, it has been argued that the system has been compromised by unscrupulous bidders. There have been several cases of such relating to the Ministry of Public Health and the Georgetown Public Hospital. As he took evaluators through a guided explanation of the bid evaluation process, Wickham stressed the importance of the evaluators understanding the key principles that govern the process of the evaluation of tenders. “There are four key principles…Non-discrimination, equal treatment, transparency and confidentiality as set out in the Procurement Act of 2003, Section 55: 1 and 2,” he said. He told attendees that in order to achieve transparency they must ensure that detailed records are kept in the form of evaluation reports, the minutes of their meetings and other information and actions deemed valuable in their process of evaluation. “All decisions must be sufficiently justified and documented. In this way, any discriminatory behaviour can be prevented and if not prevented then monitored,” Wickham asserted. Underscoring the significance of the public procurement process of which they will be a part, if they meet the necessary criteria, Wickham stressed that it is a critical part of the economic development of Guyana since it contributes to achieving government’s promised “good life”. “Public procurement in Guyana has been estimated in the order of 30-30% of GDP, due to the fact that we have a comparatively weak private sector and govnerment has to act as a primary economic driver. Public procurement is a significant lever to support social policy. For example, it acts as a development tool that enables the incorporation of vulnerable sectors in society unto the overall economic process,” he stated. “Public procurement can play a positive role in social cohesion, improvement in social standards; including living and working conditions. Within the procurement process, social considerations such as the following can be utilized- Government goes not award contracts to suppliers that exploit labour of child labour. That government supplier comply with national wage laws and policies, there is equal opportunity for male and female suppliers and all ethnic groups, GPHC access to government contracts is provided to small businesses, women – owned businesses and those of the disabled,” he added even as he pointed to the provision of opportunity for community participation. Wickham said that after yesterday’s session and feedback from participants that they want to go forward with training “then the serious training starts”. He said it would be then that the agency will be better able to evaluate those persons best suited for the specified tasks ahead. “You want to also know what their background is, what their experience is and so forth. You won’t put a retired teacher for a works project…you would put them to evaluate a contract for books for example, they would fit there. In choosing evaluators you do choose their expertise that they bring to the specific contract,” he said.